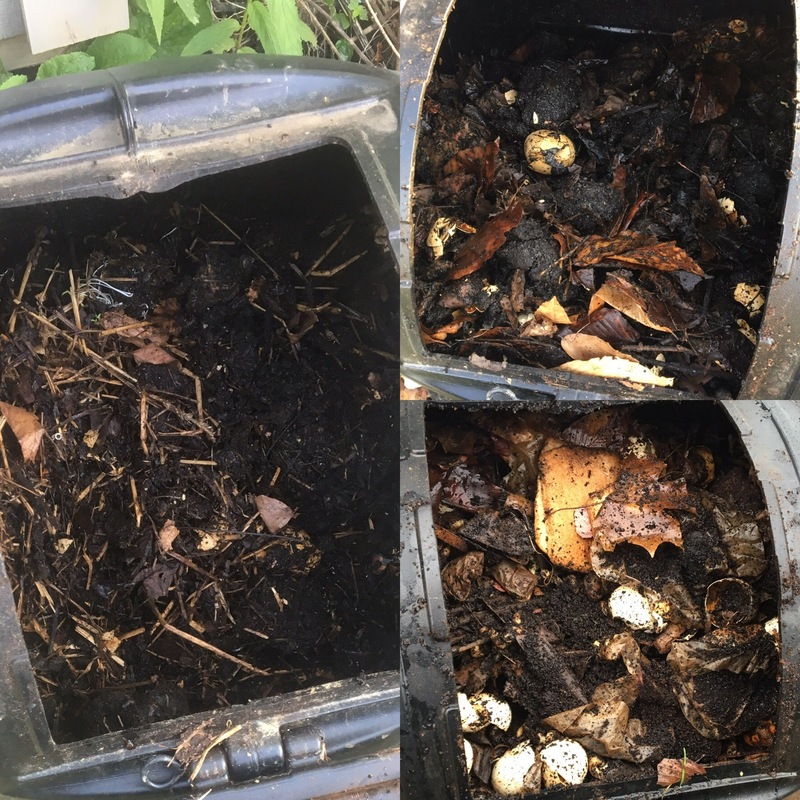 My compost July 21 (left), on April 15 (top) and December 26 (bottom). What do you do when your compost isn’t breaking down? I’m still trying to figure out the mystery that’s going on in my composter. Can you help? Last year, I decided one of my 2017 garden goals would be to get into composting. When I started asking for advice, I heard that I shouldn’t overthink it. I only needed to get a container, throw stuff in it and nature would take care of the rest. I’ve found it to be a bit more difficult than that. In October, I bought my composter: an Envirocycle tumbler. I thought about going with an old trash can with holes drilled in it, but decided to go with the option that looked best and was designed to tumble. In went some fall perennial clippings. I also planned to continue adding food scraps through the fall to keep a balance of green/brown (also known as carbon/nitrogen). We added egg shells, vegetable peels and a whole lot of coffee grounds and started turning that tumbler. Somewhere during the winter, I realized that I probably hadn’t kept a good green/brown ratio. I thought those perennial clippings would be considered brown carbon at first, but more research made me think it might actually represent green nitrogen. Those stalks weren’t breaking down much at all, so midway through the winter, I went at them with a pair of pruners to help speed things along. Through the winter, I added a whole lot of table scraps. I tossed in a bit of dried leaves and newspaper when I could, but that’s a challenge when there’s snow on the ground and you don’t get the newspaper anymore. Of course, eventually the whole thing froze. Our first truly springlike day was April 9. When I checked inside the tumbler, it was actually starting to look like compost. As the temperatures heated up, we started turning the tumbler again, but the compost just wasn’t breaking down much more. By mid-July, there were still big clumps in my composter and seeds were sprouting in there. I bought Espoma’s compost starter and added it in. For the first time, it was also looking dry, so I added some water. So nine months later, I’m still on my first batch of compost. I have a lot of beds to build and soil to amend, so I’d be happy to be making a lot more compost than this. Honestly, I’d be happy to just finish this first batch so I can get it out of my composter, start over and do a better job. Thoughts? What should I do with this clump of half-cooked humus? And how can I do it better and quicker next time?